What is the active ingredient in Neo-Synephrine® and what does it do? The active ingredient in Neo-Synephrine® is phenylephrine hydrochloride. Phenylephrine hydrochloride is a rapidly acting topical nasal decongestant, which is recognized as safe and effective by the FDA. When applied directly to the nasal passages, it causes the constriction of blood vessels in the mucous membranes, resulting in their shrinkage; this promotes drainage, thus improving ventilation and relieving nasal congestion. It temporarily relieves stuffy nose, helps clear nasal passages, temporarily restores freer breathing through the nose and helps decongest sinus openings and passages to temporarily relieve sinus congestion and pressure. How long does your nasal spray last? The duration of relief for the active ingredient in Neo-Synephrine is four hours and is dictated by what the FDA has determined is safe and effective for products containing this active ingredient. Neo-Synephrine is one of the few shorter acting nasal sprays that can be used as often as every 4 hours. You know best when you suffer from congestion and when you may need the relief that Neo-Synephrine offers. The ability to use Neo-Synephrine as often as every 4 hours gives you the ability to get relief when you need it and is one of the reasons that Neo-Synephrine has been relieving nasal congestion for nearly 75 years. There are so many nasal sprays on the market now, is Neo-Synephrine a nasal steroid? No, Neo-Synephrine® is an OTC medicated nasal spray used for the temporary relief of nasal congestion due to colds or allergies. In addition to addressing nasal congestion from both colds or allergies, the significant difference between Neo-Synephrine and nasal steroids like Nasacort® and Flonase® is that the medicine in Neo-Synephrine begins to work on contact, so you can expect symptom relief very quickly, often in seconds as opposed to waiting up to 1 week to feel the most symptom relief from a nasal steroid. Always use Neo-Synephrine as directed and do not use for more than 3 days in a row. Can I use Neo-Synephrine for my allergy symptoms? 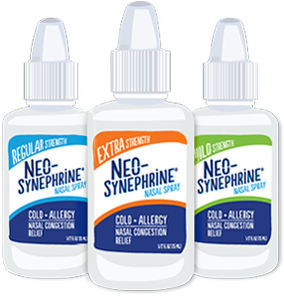 All Neo-Synephrine® products can be used to temporarily relieve nasal congestion due to allergies (hay fever or other upper respiratory allergies (allergic rhinitis)) in addition to relieving nasal congestion due to the common cold. Should I use Neo-Synephrine on my pets or any animal? Neo-Synephrine® is not indicated for animal use and it is critical that you check with a veterinarian prior to giving it to an animal. Should I blow my nose after using Neo-Synephrine? There is no specific amount of time that you should wait prior to blowing your nose. The medication in Neo-Synephrine® will begin to work upon contact as it is absorbed into the nasal passages. Please be assured that even if you do blow your nose shortly after use, the medication will be effective. Are there different dosage instructions by age & formula? Neo-Synephrine® comes in three different strengths: Mild, Regular, and Extra Strength, so you can select the right strength based on your own needs. All three are suitable for adults and for children 12 years and older. In addition, the Mild Strength formula may be used by children aged 6-under 12 (with adult supervision). Always read and follow the label directions before use. Will Neo-Synephrine make me drowsy? No. Neo-Synephrine® Spray formulas do not contain any medicines that would make you drowsy. They are specifically designed to shrink swollen membranes in your nasal passages to help clear nasal congestion. Can I take Neo-Synephrine with other medications? Because interactions between drugs are always possible, a doctor or pharmacist should always be consulted when taking multiple medications. How is my Neo-Synephrine Nasal Spray different than an oral nasal decongestant? Neo-Synephrine® Nasal Sprays contain the same active ingredient as many over-the-counter oral nasal decongestants. One of the advantages of using a nasal spray over tablets is that it works immediately since it is applied locally where the congestion occurs—in your nose. Should I use this product if I am pregnant or breastfeeding? As with any medication, if you are pregnant or breast-feeding a child, contact your doctor before using this product. Is Neo-Synephrine safe to use every day? Neo-Synephrine can be used daily up to 3 days consecutively and should be used only as directed. Frequent or prolonged use may cause nasal congestion to recur or worsen. If you still have congestion or your symptoms persist after 3 days of using Neo-Synephrine, you should stop use and consult a doctor. What is the shelf-life for Neo-Synephrine? Each bottle of Neo-Synephrine® has an expiration date 24 months from the date of manufacture. Do not use beyond the labeled expiration date. Why does my Neo-Synephrine bottle seem half-full? Each bottle of Neo-Synephrine® contains the full amount of medicine that is indicated on the label. The extra air space in the bottle is needed to properly dispense the spray. Is there gluten in Neo-Synephrine? We do not add any gluten to our products. However, we cannot guarantee that they are 100% gluten free as this product is produced in a facility that manufactures or packages other products. If you are like us, you always have lots of questions. Rather than try to answer them all right here, we encourage you to contact us either through our Customer Call Center at 855-565-5800 on weekdays from 9 AM to 5 PM Eastern Standard Time or via the Contact Us page on this website. Thank you for your interest in Neo-Synephrine.